After a long while and several wrong turns I finally made it to the University. In hindsight it wasn’t difficult to find it, but the twisting and turning alleyways of Friedwang Bezirk surprised me many times. Finally I had to give a pie seller a penny to show me the right way, and finally I arrived. 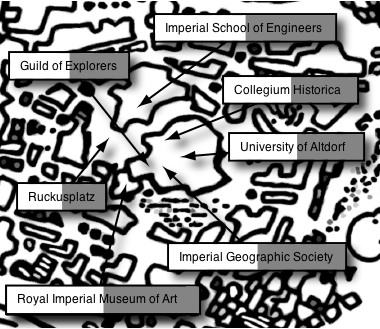 Now that I think of it, it was obvious that the Uniersity would be the largest structure of the Universität Bezirk. I came in via the Ruckusplatz, or Speaker’s Corner as it is also called. Due to the wintry conditions only a few rabble rousers and agitators were poised on their crates and barrels delivering their fiery dogma onto the cats and dogs that made up the audience. The University is made up of several small and large buildings, societies, museums, clubs, libraries, and so on so forth. On the map above you find a few of the more noteworthy, but exploring the University can be an adventure in itself, and a place where you as a GM can start many adventures, or use as a place for researching clues or asking old professors for advice.